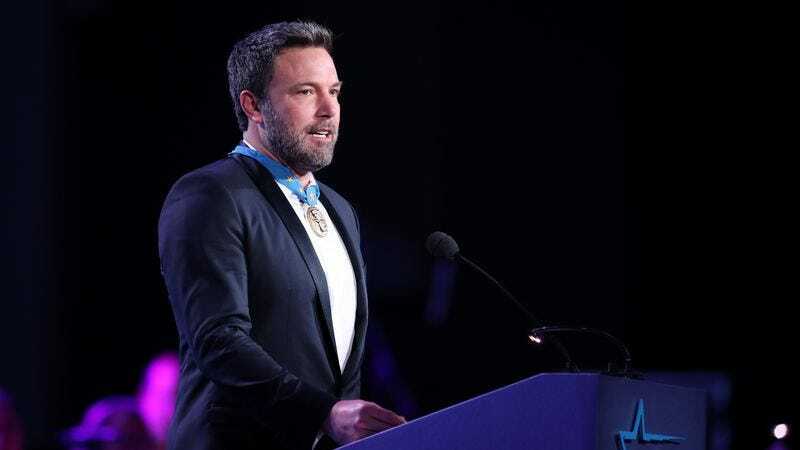 Given that it’s a team-up between one of the world’s most popular actors, and one of its most beloved superheroes, Warner Bros.’ Ben Affleck/Batman sub-franchise has gotten off to a shockingly rocky start. Although Affleck seemed comfortable enough in the part in Batman V. Superman—and even agreed to some light cameo duty in Suicide Squad—trouble has continued to plague the standalone film version of The Batman for months now. First, Affleck opted out of directing the movie, and, when the film finally did find someone to helm it—Planet Of The Apes mastermind Matt Reeves—he ended up tossing the script Affleck had written for it. THR also notes that Affleck—whose next Batman role will be in Justice League, which is undergoing re-shoots after Joss Whedon took it over from Zack Snyder earlier this year—is significantly older, at 44, than the rest of his JL action movie co-stars (Jason Momoa, the second-oldest, is 37.) Meanwhile, the actor recently dropped out of Netflix’s Triple Frontier, saying he wanted to spend more time with his family. So it’s not outside the realm of possibility that actor and studio alike might be ready to start looking for an elegant—i.e., sequel-friendly—way to move him out of the part.